I, THEREFORE, T. S. AIREY, C.B, C.B.E., Mayor General, Commander British and United States Forces, in order to implement the provisions of the Treaty of Peace, and to ensure the welfare and safety of the population by preserving law and order, have issued the following proclamation, which is being communicated to the Security Council of he United Nations by the United States and United Kingdom Governments. 1. 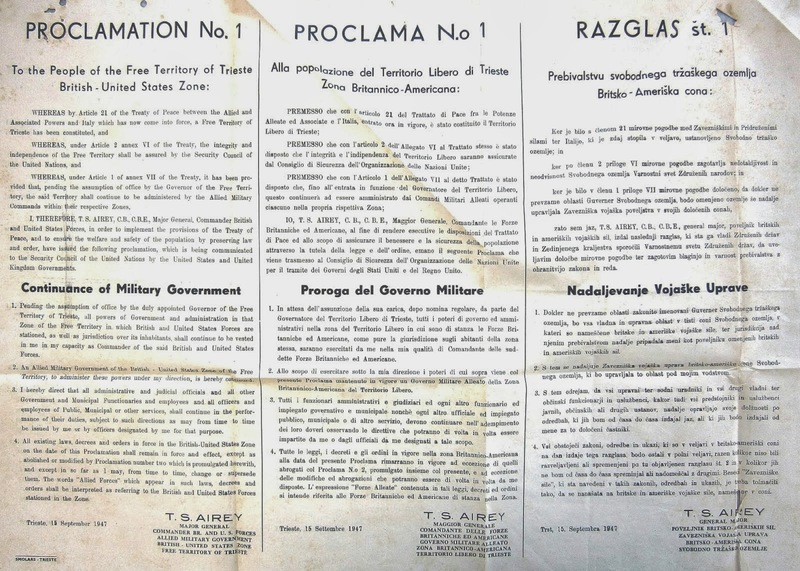 Pending the assumption of office by the duly appointed Governor of the Free Territory of Trieste, all powers of Government and administration in that Zone of the Free Territory in which British and United States Forces are stationed, as well as jurisdiction over its inhabitants, shall continue to be vested in me in my capacity as Commander of the said British and United States Forces. 2. An Allied Military Government of the British – United States Zone of the Free Territory, to administer these powers under my direction, is hereby constituted. 3. I hereby direct that all administrative and judicial officials and all other Government and Municipal Functions and employees and all offices and employees of Public, Municipal or other services, shall continue in the performance of their duties, subject to such directions as may from time to time be issued by me or by officers designated by me for that purpose. 4. All existing laws, decrees and orders in force in the British – United States Zone on the date of this Proclamation shall remain in force and effect, except as abolished or modified by Proclamation number two which is promulgated herewith, and except in so far as I may, from time to time, change or supersede them. The words “Allied Forces” which appear in such laws, decrees and orders shall be interpreted as referring to the British – United States Forces stationed in the Zone.